Need help getting started? Sign up for a live web demo today. They are FREE and we run them everyday. Prolink is proud to announce the release of QC-CALC v.3.2. This new version includes many new important features that are listed at the link below. Administrative Tool - This new tool allows you to centralize all settings within QC-CALC across your plant. You can create groups with different levels of access to features and then assign workstations to those groups. This is a very powerful feature for shops with several copies of QC-CALC. CFR21 Part 11 Support - Within the new Admin functionality is a Part 11 mode that allows you to restrict users from changing data in any way without the validation of a user id, password, and reason code. Full Audit Trail - A complete audit trail of all changes is automatically recorded. Visual Indicators - Plot points change color to indicate a change has been made. Support for Digital Signatures - You can now digitally sign Adobe PDF reports. Support for Electronic Signatures - You can now add an electronic image of your signature to the report. This way you know it's been signed even if you print it to paper. Audit Trail Report - A report of all changes to the data within the specified data range. Support for LDAP - The ability to host the user information via an LDAP server rather than internally. Point Properties - QC-CALC SPC now has full point properties, plot properties and quick stats. Dimension and Record filtering has also been enhanced. Tips & Tricks: Use SMTP Mail for emailing reports! As viruses that use your address book to mail themselves far and wide have become popular in recent years, newer versions of both Outlook and Lotus Notes have tightened their security. In both cases, they no longer allow outside programs such as QC-CALC to use them to send email. As an example, if QC-CALC attempts to send an email via newer versions of Outlook, a message appears asking you whether or not to allow this activity. This, of course, defeats the purpose of automatic emails if you have to give permission each time QC-CALC tries to email a report. To respond to this, more and more software has started using Simple Mail Transfer Protocol (SMTP) as another option to send emails. QC-CALC 3.0 and 3.2 allow you to continue to use your old method if it still works and also support SMTP Mail if you need to migrate to this solution. Unlike the traditional method of sending email through Outlook, the SMTP method literally communicates directly with an actual mail server. As such, it doesn't matter which email client (Outlook, Notes, Eudora, etc) you have on your local machine since these are no longer used. When you configure SMTP mail, you specify a particular user name and password which is authenticated with the server before the mail is sent. This keeps it secure and is actually a cleaner solution since it does not depend on your locally installed programs. Speak with your IT department about Firewall issues and find out the server information. Go to Tools > Options > Email. 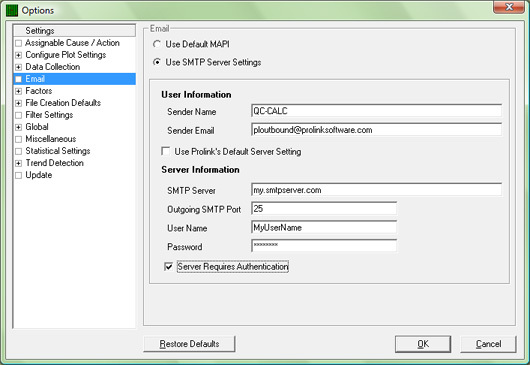 At the top of the screen, choose Use SMTP Server Settings. Uncheck Use Prolink's Default Server Setting. Fill in your server information including the address, user, and password. Check Server Requires Authentication at the bottom. Click OK. The next time an email is sent, it will send via SMTP.